On center stage is a large, green chalkboard mounted on a wooden swivel frame. Standing stage right is geeky Lab Coat Man wearing a white lab coat with many pens in his pocket protector. He’s wearing oversized black oval glasses and holding a long wooden pointer. On stage left, next to the chalkboard, is a six-foot Toucan wearing a large striped tie. 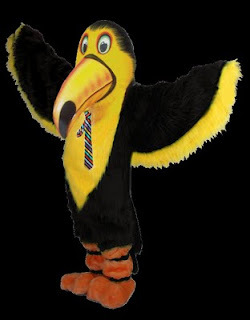 He has a giant yellow beak he uses rhythmically when he dances. A door is visible in the background. The Italian song, "Zooma, Zooma"
starts up with a vamp, waiting for Lab Coat Man to begin his song. He begins to sing, pointing to the lyrics on the blackboard as he sings them in an Italian accent while Toucan dances gaily in place. More vamping and Toucan dancing while the sound of loud knocking becomes apparent, as if from an adjacent wall or ceiling. It’s Angry Neighbor shouting muffled complaints that cannot be heard clearly. More vamping and Toucan dancing while the sound of knocking grows louder and Angry Neighbor’s voice becomes more furious. Lab Coat Man flips the blackboard over where the words of the chorus are written in large letters for the audience to sing along. Suddenly, Angry Neighbor bursts through the door and points a gun at Toucan while the music abruptly slows down and stops with the sound of a needle scratching across the surface of a record. ANGRY NEIGHBOR: I told you! No pets! Angry Neighbor shoots Toucan with a gun that ejects a red flag upon which the word “Bang!” is written. Toucan grabs his chest, swoons and attempts to hold on to the blackboard, then collapses on the floor. Lab Coat Man pulls out a gun from his pants pocket and shoots Angry Neighbor. His gun also ejects a red flag with the word “Bang!” written on it. Angry Neighbor grabs his chest as Toucan did and collapses behind Toucan. The song, “You’ll Never Walk Alone” begins to play while Lab Coat Man bends over the dying Toucan. LAB COAT MAN: (After mournful consideration of Toucan, holding his wing, looking into his eyes) You’re the last toucan Angry Neighbor will ever shoot—on this planet anyway! TOUCAN: (Looking lovingly at Lab Coat man with raised head, then as he lowers his head, with his dying breath) Ahhhhhhhhhhhh! LAB COAT MAN: (Standing up and turning toward the audience) Now, the alternate ending! Lab Coat Man and Toucan resume their places while Angry Neighbor leaves the stage. The scene repeats. "Zooma, Zooma" begins to play. Suddenly, Angry Neighbor bursts through the door and the music abruptly slows down and stops with the sound of a needle scratching across the surface of a record. ANGRY NEIGHBOR: You’re having a party and I wasn’t invited? LAB COAT MAN: Why of course you’re invited. The party hasn’t started yet. We were just rehearsing! There’s a loud knocking at the door. Lab Coat Man opens the door and Pizza Delivery Boy enters. PIZZA DELIVERY BOY: One extra-large banana pizza to go! Lab Coat Man, Toucan and Angry Neighbor all look at one another for a moment, then burst out laughing while the “Zooma, Zooma” vamp begins again. They all sing the chorus together. LAB COAT MAN: Come on everybody! Sing along! All begin to sing, while singing offstage actors costumed as slices of pizza wearing ties dance onto the stage, tossing slices of pizza to the audience. Singing continues until audience enthusiasm begins to wane as actors leave the stage. Then the music is abruptly slowed and stopped as before with the sound of a needle scratching across the surface of a record. Angry Neighbor pulls out a machine gun. ANGRY NEIGHBOR: Wait a minute! I told you no pets! Angry Neighbor shoots Lab Coat Man and Toucan in a barrage of fire. Their bodies shake as they are riddled with bullets, then crumple to the ground. Angry Neighbor surveys the carnage, then blows smoke from the barrel of his machine gun, grabs a piece of pizza and exits through the door.